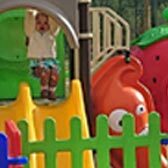 For your pleasure and the one of your children, we put at your intention an immense play area. 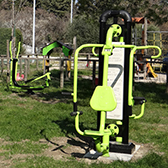 The playground for children is situed in the center of game space. They can enjoy the slide, spring game or climbing game in all security. 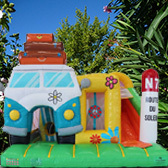 The older children will like the inflatable castle, to have fun, jump safely. Your children will have funny moments. Always at the center of the playground, you will find a place for playing bowls. We organize seasonal bowls tournaments ... in the most friendly! 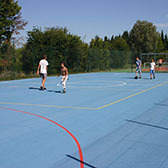 A multi-sports playground is a meeting place for all lovers of football and basketball. 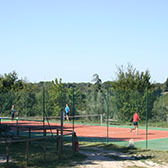 Adjacent to the multi-sports playground, you will find a tennis court, a mini golf course and a large grass area with a outside table tennis. During the high season, we offer some activities while respecting the peace of other guests. In the evening and after a hot day, you'll enjoy coming to taste a glass of wine from the cellar of Terres d'Avignon. 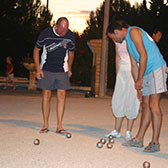 You can participate at the bowls tournaments or other family events organized. 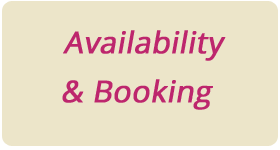 Approved Camping Bacchus since april 2014.